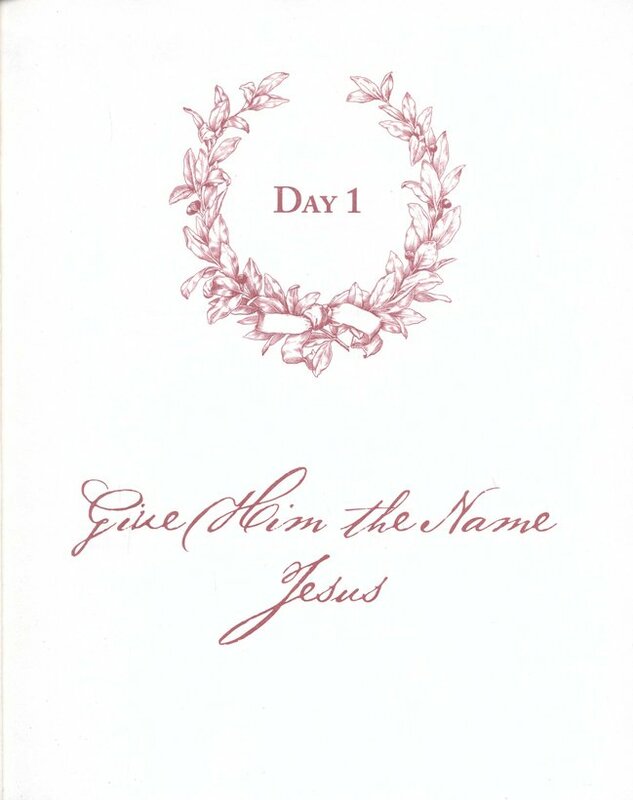 Welcome to day one of Jesus– 90 Days with the ONE and ONLY. Give Him the Name Jesus. Jesus. What do you feel when you hear His name? Power? Peace? Comfort? For me, all of those and more. Beth Moore asks the question: “What hope does He stir up in your spirit?” I listed out several things —-as just saying His name in my mind pushed the play button of my life’s tape. I saw myself at various times “relying solely” on His name. Remembering lying prostrate on the floor crying out His name is usually first in my heart and mind. I felt the peace that only His name brings. It is hard to fathom what might have been Mary’s feelings being told this news. Trying to “place myself” in her shoes, I think I would feel completely unworthy. Totally aware of my own human nature—afraid of failing El Olam, the Eternal God, the Everlasting God. El Roi–the God who sees. Nothing is hidden from His view. Aimee and I shared a recent devotion from Psalm 139. The psalmist David said “O Lord, you have searched me and you know me. You know when I sit and when I rise.” That is the perfect picture of God’s all seeing, all knowing eye. His eyes are omniscient. I wrote in the margin of my book, “nothing is hidden from His view.”…Nothing. He’d been watching Mary’s life. He had been watching the way she was brought up. He watched and knew her obedient and willing heart. It was not one put on for show. It was honest. Sincere. Considering that nothing is hidden from His view, I wonder if Mary tried to recall any part of her life for closer examination. I know that every single time I have been asked to participate in a project—or take on a new assignment for the LORD, my shortcomings and all the areas I feel unqualified in come rushing to the forefront of my mind like the ocean waves crashing on the shore. I wonder if this happened to Mary. Beth reflects a bit on the “whereabouts” of Mary—suggests what she might be doing. I don’t know why I have always thought this—but for some reason, I have always pictured Mary in the barn–doing her daily chores. Going about her daily routine…perhaps she was contemplating God. Maybe–singing a song of praise to the top of her lungs! Or quietly humming to herself. No matter where she was—it is evident—she was alone. As Aimee and I discussed recently—knowing that Mary was alone gives us reason for reflection in our own lives. Aren’t we usually “alone” when we feel the Lord speaking to our hearts? We feel that nudging in our spirits—that causes us to pause and lean in to Him for a listen? Has He ever told you something in the deep part of your heart/spirit that took your breath away? I imagine that for Mary—this visit from Gabriel—simply made her catch her breath! I can almost hear her intake of air as she realizes that she is no longer alone! The exchange between Gabriel and Mary has always intrigued me. Many years ago I wrote a play for our church for a Christmas production. I found myself longing to have a “hidden camera” for the scene between this pair! Her racing pulse must have been evident to Gabriel because he quickly assured her with “fear not”. And, I like to imagine, when he spoke aloud the Name the infant was to be given —peace swept over her like a warm blanket. It does for me. A more powerful name does not exist. But not just because of the name itself—Beth relayed that it was a commonly known/used name in those days. However,it is the Owner of the name that brings the peace and power! I was so blessed by this first day of study—as we joined Mary in the “barn” —(or wherever you have pictured her!) I was glad to be privy to this intimate conversation between the messenger of the holy God and the daughter He chose to bring His life into the world. I have really thought much about my own life—and how I conduct myself on a day-to-day basis. I know there are many times I fail. But as the microscope is targeted on my heart—I am allowing HIM to peel away the pain from the past years and create clean flesh—remove the stone—and the areas where I may have begun to harden due to some harsh realities of life. I WANT to be a fit vessel. I want to be considered “favorable” by Him. I hope you have answered the questions she posted for us on page 5–these are personal reflective questions…I answered mine—laying my heart bare for HIM to know and see. I write in the margins of my book and use a highlighter as well. You do what suits you best! Above all—listen closely for what He may say to you in these 90 days! I am looking forward to this journey with you! Father in heaven, thank You for this incredible Gift of life that YOU freely gave to each one who chooses to believe and follow Your path. I am unworthy of this on my own…but through the life, death and resurrection of Your Son, Jesus—we are made worthy—His bride! Fill me with wisdom and knowledge as we study Your Word. Help us to be able to share this love with others! This incredible love! Thank you for this opportunity! We give You all the praise—in Christ’s name we pray~Amen. Sisters of Faith—we journey on! Aimee will be sharing from her heart tomorrow—so read up! Be ready! I love you all! This entry was posted on Monday, September 1st, 2008 at 12:01 am	and posted in 90 Days with Jesus Bible Study. You can follow any responses to this entry through the RSS 2.0 feed.